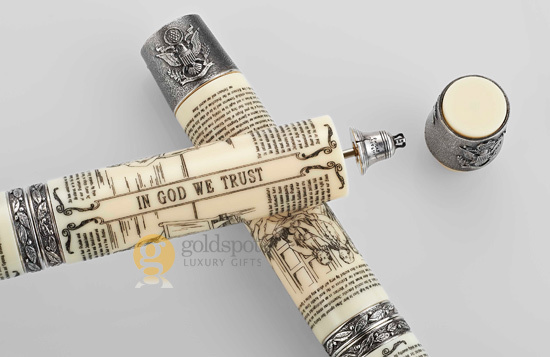 The initial response and buzz surrounding the release of Visconti's anticipated Declaration of Independence Limited Edition pen is suggesting that this will be one of Visconti's biggest pen releases...ever. Here are some sneak peak photos and details about the pen you may not have known. Commemorating a pivotal moment in our Nation's history, along with the history of the modern world, the Declaration of Independence Ltd Ed presents itself as a historical collectible. 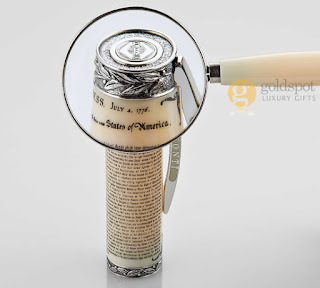 The entire Declaration is done in scrimshaw around the barrel of the pen, visible enough to see with the naked eye. 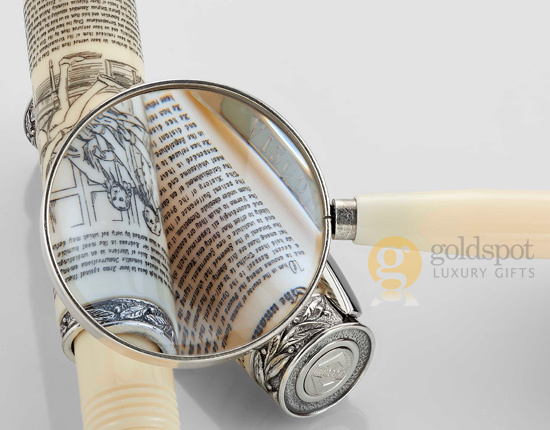 Every detail on this pen is so intricately superb that a magnifying glass is supplied in the box with each pen for its owner to further investigate the flawless craftsmanship and artistic handiwork of Visconti. The Liberty Bell, one of the most iconic American symbols, is used in the fountain pen's plunger filler. This detail was previously not photographed in the initial press about this pen, so it is a real thrill for us to have a picture of this part. Your first opportunity (and best chance to get a good edition number) would be at the Philadelphia Pen Show, which will be from Jan 21st to 23rd. 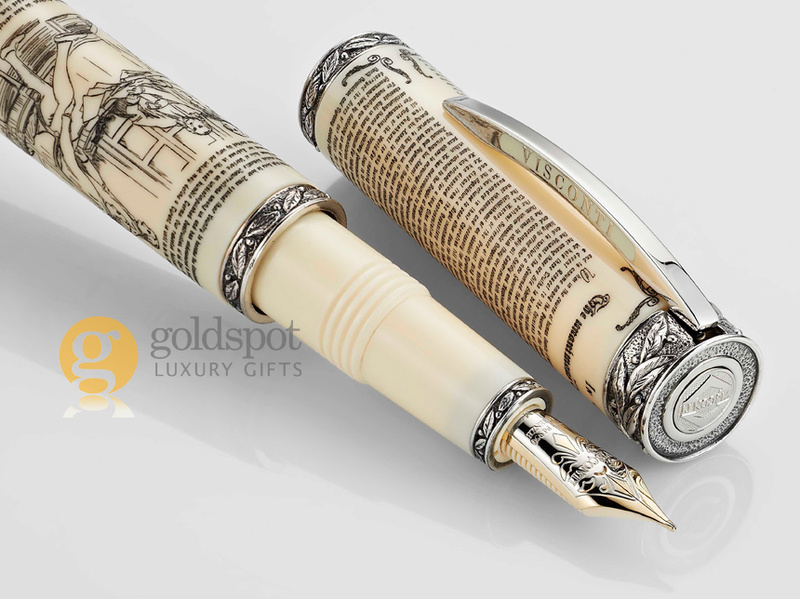 Goldspot Pens will be there, with these pens-in-hand. 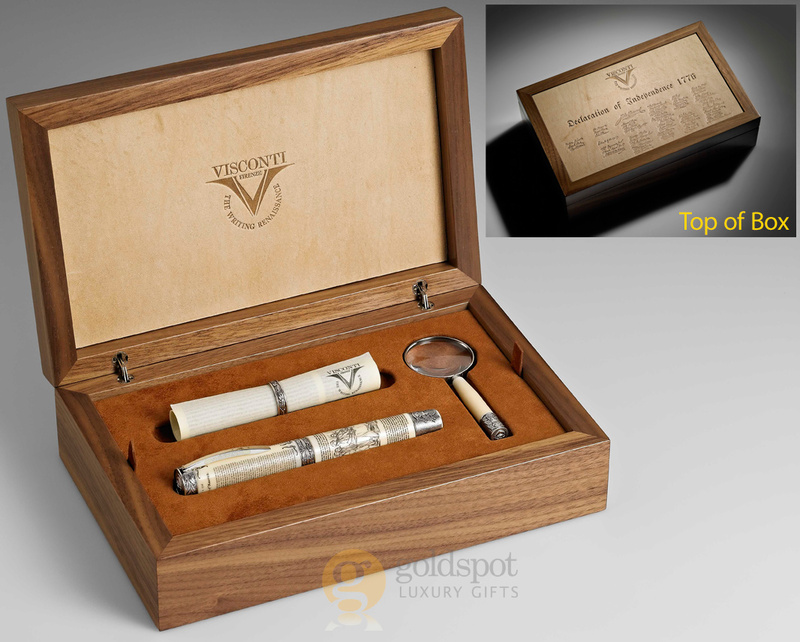 You can pre-order this pen at Goldspot (call for pricing - serious inquiries only) and pick it up at the show, or have it shipped after the show is over. Any orders for the Declaration of Independence taken after we run out of stock will be fulfilled within the week following the show. For more information on location, times, vendors and price for entry, please visit the Philadelphia Pen Show Website. Hope to see you there!